Eric William Carter, a native Houstonian, graduated from Strake Jesuit. He earned a B.A. in Political Science from The University of Texas and completed U.T.’s Business Foundations Program. Eric received his Juris Doctorate from the South Texas College of Law in 2006. Eric was first elected to be the Justice of the Peace for Precinct 1, Place 1 in 2016. While attending the University of Texas, Austin, he served as Legislative Aide to a former Texas State Representative and clerked for the House Committee on General Investigating and Ethics. Eric joined his family's firm, The Carter Law Firm, at the age of 24. He began his legal career by jointly managing a docket of 4000+ cases and trying hundreds of Medical Fee Dispute Resolution cases before the State Office of Administrative Hearings in Austin, Texas. He went on to build his litigation practice by assisting individuals, families and small businesses manage various types of disputes, including: commercial and business litigation, fraud and negligence actions, contractual disputes, personal and business torts, federal SEC regulations, real estate transactions, landlord/tenant actions, and more. His experience included representing both Plaintiffs and Defendants. Community service, for Eric, began at an early age. He worked with his parents, volunteering through his local church, to repair flood damaged homes. As a teenage member of the Amigos de las Américas -- a community health-promotion program serving Central and South America -- he travelled to La Maravilla, Costa Rica to work for an entire summer. For his efforts, he received a Presidential Student Service Award from President Bill Clinton. He is a former member of the Board of Directors of Wesley Community Center, a center with the mission of "helping people help themselves and each other" in the Near Northside, Houston. As a Freemason and a member of the Arabia Shrine Temple, he remains dedicated to those who need help the most: injured children. 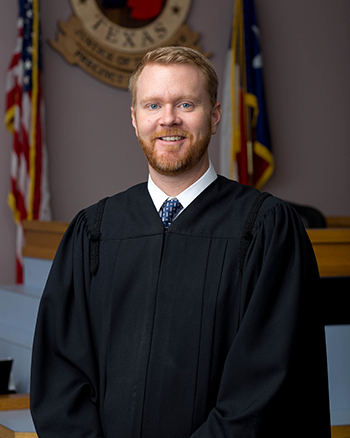 With his brother, District Judge Kyle Carter, he participates in a judicial outreach program called Judges at Work in Schools (JAWS), which is designed to bring the courtroom to the classroom and educate Houston’s youth about the judicial system. His service continues through various programs in and around Precinct 1 and through his Teen Court Program, designed to educate and empower our youth. Eric is the youngest son to Eric G. Carter, a trial lawyer, and Rev. Dr. Suzan Orr Carter. His brother, Kyle Carter, currently presides over the 125th Civil District Court of Harris County, Texas. Eric and wife Lauren wed in November, 2015. The two live in Precinct 1 with their dog, Ruby, and cat, Dylan.